Want to improve your Instagram marketing? Are you interested in the latest tips and tools? 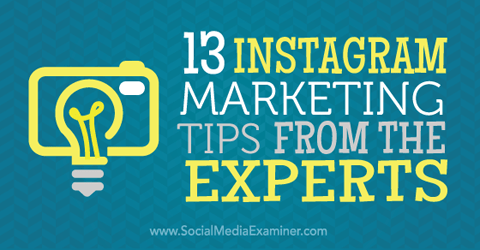 Here are the latest Instagram marketing tips from the experts. Are you interested in the latest tips and tools for Instagram? Instagram is a fast-growing platform and businesses are eager to establish a presence and encourage engagement on the network. We asked social media experts to share their hottest Instagram tips. One of the best ways to save time and compose better photos for Instagram is to shoot square photos. Many digital cameras and smartphones have this in their settings so it’s really easy to do. This let you save time on cropping and ensures that the essential elements in the photo won’t be cropped out later. Because shooting photos inside the Instagram app can be limiting, I like to use Camera Awesome by the SmugMug team on my iPhone (also available for Androidusers). Using this app, you can take fantastic photos using the grid to follow the rule of thirds. One of the most important things marketers need to know is how well their Instagram account is driving traffic and leads back to their website. Unfortunately, Google Analytics can’t accurately track this traffic when users visit your website from your mobile Instagram account. To monitor accurate click rates, I recommend businesses use acustomized bit.ly link (or a link from another shortener) exclusively for the URL in their Instagram bio. Then you can check your bit.ly data to document how many clicks your Instagram account is actually sending to your website. Create a different bit.ly link each time you change the link for a new landing page, campaign or default page to continuously track successful traffic leads. Jenn Herman is a social media trainer, blogger and Instagram advocate. For personal use, Instagram is fun and spontaneous. But if you want to use it as a marketing tool, you have to be a little more calculating with it. I suspect the businesses that are really killing it on Instagram (like Nordstrom, Starbucks, Nike and others) plan their posts well in advance. If you’re a smaller brand or a one-man show, you can still develop a great presence on Instagram. Use the link in your bio to connect to a landing page that holds the same posts you put on Instagram, and allows you to collect leads, promote your ecommerce site, gain subscribers to your blog, collect entries for a giveaway,etc. Jim Belosic is the CEO of ShortStack. Locally we have restaurants that serve beer from the many craft brewers in the area. Both the brewers and the restaurants take full advantage of Instagram by tagging each other. The brewers also support one another with tap takeovers, which are rich grounds for Instagram photos and tags. The results are threefold: higher recognition for everyone involved, increased followers (who in turn tag the businesses during visits) and increased traffic and sales for the local businesses. Lisa Karl is a partner and founder at Savvy Digital Business. Users can now use Instagram’s Explore feature to find posts related to trending hashtags such as #LoveWins, #CanadaDay and #FullMoon. If these trending tags are relevant to your brand, include them in timely posts to aid discovery. On the topic of search, Instagram also introduced the ability to search by emoji. If emojis make sense for your brand’s strategy, be sure you’re thinking about how they can be a great channel-appropriate way to convey what copy can’t, but also how they can aid in discovery. Jim Tobin is the president of Ignite Social Media and the author of Earn It. Don’t Buy Itand Social Media is a Cocktail Party. For most brands, getting a follow on Instagram is important, but it’s just one step in the overall marketing funnel. To move your users further down the funnel, you should consider identifying ways to capture your followers’ email. One of the best ways to capture your followers’ email is to ask for it. Share an image with a call to action in both the caption and visual telling users to click the link in your bio to download an ebook or sign up for a newsletter. Once the user takes this action, you’ll have the ability to engage with them on a one-to-one basis and take your connection to the next level. To do this effectively, you should create a targeted landing page tailored directly to your Instagram following. Use messaging that references Instagram and shares a similar look and feel as your brand on this channel. From there, engage with your email subscribers by delivering them valuable and relevant information that will help move them down the funnel. Drive them to your blog posts and other social channels and keep them up to date with your product or service. Ross Simmonds is the founder of Foundation Marketing, Hustle & Grind and Crate. My hottest Instagram marketing tip is to mix up your posting strategy by including videos in addition to photos. Considering that a video can generate three times more inbound links than written posts, it’s a valuable tool that can be used to engage fans, grow your following and drive traffic. As marketers, we all know that Instagram is about visual storytelling, but with a video you can actually bring your story to life. For example, take a look at Oreo or McDonald’s and you’ll see awesome examples ofstop motion videos that feature a product at the center of the video, without coming across as a sales pitch. The videos are fun, shareable and engaging, and with Instagram’s video editing features they’re super-easy to create. Simply hold down the Record button and pause when you want to shoot a different scene. Or you can upload a pre-made video. And if you don’t want to include your product, you don’t have to. Encourage your fans to create their own videos and collect them on your page like GoPro does. Or check out the most-followed brand Nike to see plenty of effective videos. This is a brand that has a really good grasp of what Instagram is all about: inspiring viewers by using powerful visuals that focus on the audience, not the product. The key here is to make it about your audience rather than your business, and you’ll quickly see a surge in followers! Sarah Quinn is a copywriter for content marketing agency Wyzowl.